There is considerable evidence that lipids, and specifically prostaglandins (pgs), can contribute to progressive tumor growth (1). 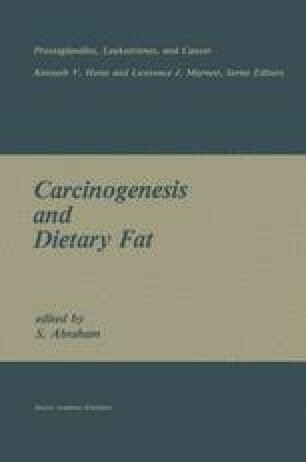 Many studies provide evidence that lipids can contribute to early steps in carcinogenesis, in particular early promotional events. Recently, efforts have been directed towards examining the contribution prostaglandins make to the successful metastasis of tumor cells from the primary site. For breast cancer, perhaps more so than any other type of malignancy, prevention of metastasis is the ultimate clinical problem. It is also in this disease that some of the earliest evidence for a role for prostaglandins has been provided.